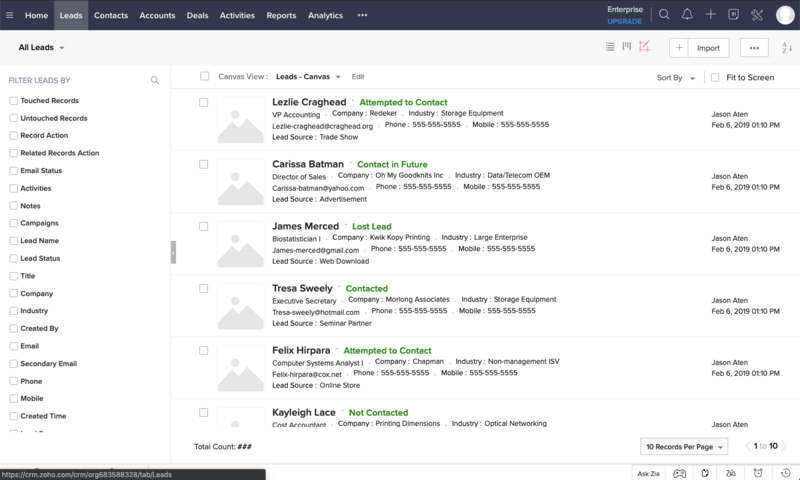 Zoho CRM is a comprehensive customer relationship management system designed for small businesses featuring robust contact and deal management functionality, as well as inventory, proposals, and order management. Getting started using Zoho is as simple as signing up for a plan, configuring the tool for data and your process, and integrating it with other programs. Zoho CRM offers plans starting at $12 per user, per month, as well as a free-forever plan for up to three users. The free plan includes basic CRM features, as well as a social media integration that lets users capture leads and enter them into your sales process. Visit their website to start a 15-day free trial of any plan, or create your free account today. Before going too far in figuring out how to use Zoho CRM, you’ll need to consider which plan will work best for your business. Depending on the features you need, Zoho offers a range of plans designed to meet the needs of almost any business, from the solopreneur just starting out to larger multi-tiered sales teams whose CRM strategy needs more advanced reporting and management functionality. Zoho CRM’s free-forever plan includes contact and deal management for up to three users, web forms, and basic reporting. Users on the Free plan can also integrate their social media accounts and have access to the overall Zoho suite of productivity software, which includes document creation, email, and cloud storage. The Free plan is a good fit for individuals and freelancers who want to manage contacts and deals, and consolidate their productivity tools into one solution. The Standard plan at $12 per user, per month is comparable in price to other CRM entry-level plans, and includes the contact management tools found in the Free plan. In addition, it gives you custom field creation, performance dashboards, and bulk email sending (up to 250 per user, per day) as well as sales forecasting and email insights. This makes the Standard plan a good choice for small businesses that market and generate leads through social media. The Professional plan costs $20 per user, per month, and adds advanced features like unlimited custom reporting, lead assignment rules, and the Sales Signals feature, which sends real-time notifications of social media interactions, customer interactions, and website activity. The Professional plan also includes product catalogs, order management, and invoicing, which make it a great choice for contractors, HVAC installers, and landscape maintenance firms. Once you’ve chosen a plan, the next step is to configure the software to meet your sales team’s needs. This means setting up custom fields, deal and pipeline stages, scoring rules, and reporting. 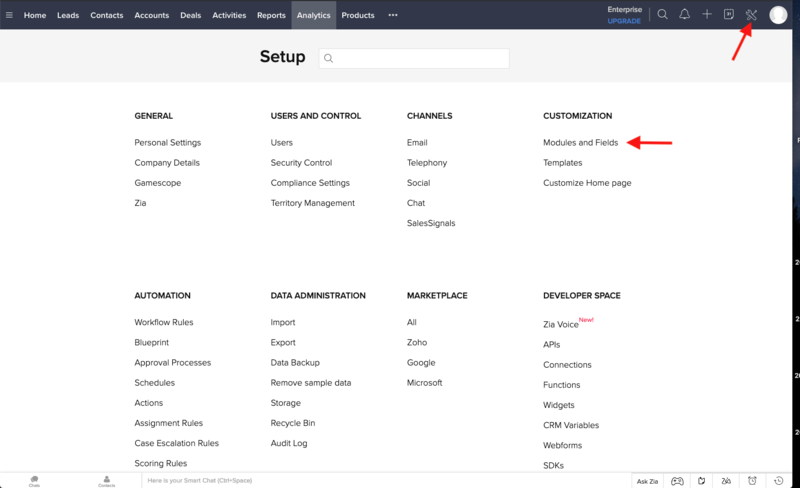 Fortunately, Zoho makes it relatively easy to get started using the Setup menu, which includes all of the main modules and system-wide settings you need to configure. 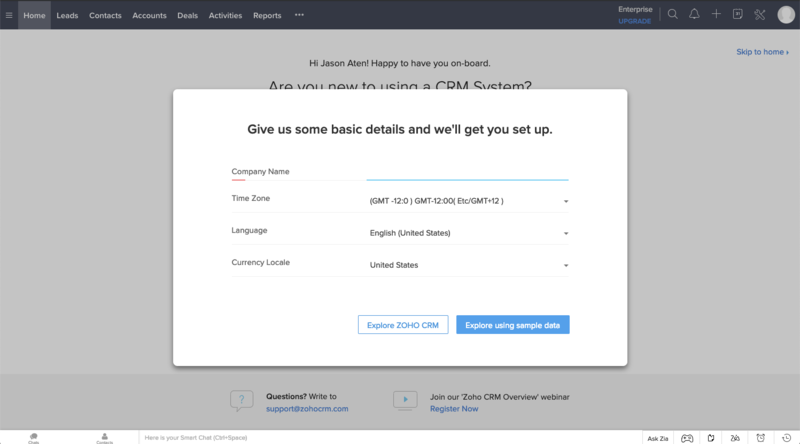 Pro Tip: If you want to look around and learn how to use Zoho, the CRM includes the option to explore the software with sample data. Once you’ve looked around, you can then delete this information and start fresh. To configure your settings, you’ll find the setup icon in the upper left corner. It’s the one that looks like a hammer and screwdriver. Click on this icon to access all of the setup tools you’ll use to get your software ready to go. We’ll specifically walk through setting up your contact fields, deals, sales pipeline stages, and lead scoring. To start, click on the “Modules and Fields” link under Customization. This will give you the opportunity to set up your contact records and create custom fields for tracking information. We will start with Contacts, but you can follow the same steps to add and configure custom fields for your Lead records. Selecting “Contacts” will bring you to a page where we can customize how contact pages appear. By default, Zoho has a huge number of data fields, including ones like Skype ID, Fax, Assistant Phone number, etc. Some users will find many of these fields unnecessary. Therefore, to keep things more manageable, consider removing fields you won’t use on a regular basis. This will make things easier for you and your team to navigate. In this view, you can drag and drop to reposition fields or click the trash icon to remove them. You can also add custom fields that fit your specific business and sales process. To do this, drag the type of field from the selection list on the left to the contact profile. This will bring up a window that allows you to customize the field’s properties, and gives you the option of choosing default values and indicating whether the field should be required. The Deals module is where you track your sales opportunities in Zoho, and represents one-off or ongoing sales that you are moving through your sales process. 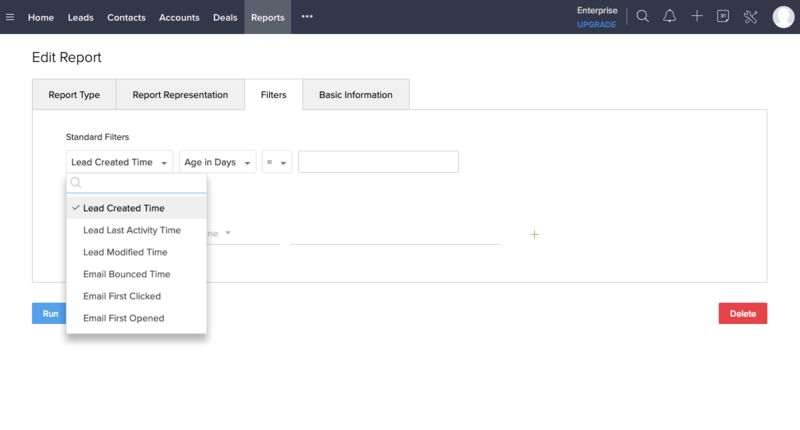 Zoho allows you to customize the information you capture about each deal, including the deal stages as well as the probability of closing a deal at each stage. This will help you better understand and forecast which sales opportunities you are most likely to win, and where you should invest your time and energy. Zoho CRM comes with a generic list of sales stages (Qualification, Needs Analysis, etc.) However, you can customize these stages to your own unique sales process. Simply select the “Stage” field and you can adjust both the Stage Name and Probability for each. Once you have your own stages and probabilities saved, you’ll be able to start tracking your sales and generate reports based on the value and probability of each deal. One of the powerful benefits a CRM software provides is helping you quickly qualify leads and determine which ones are worth investing your time and effort to win. Lead scoring functionality, which is available in some CRMs, gives you the ability to assign values based on your lead’s characteristics and specific activities that result in a higher likelihood of a lead becoming a customer. For example, you might assign a higher value to a job title that you associate as a decision-maker, or you might add points every time a lead clicks on an email link. To do this, choose the Scoring Rules option under “Automation.” This will give you the option to add scoring rules to Leads and Deals. We will briefly look at how you can set this up to help you better qualify leads and identify the most valuable leads in your sales process. 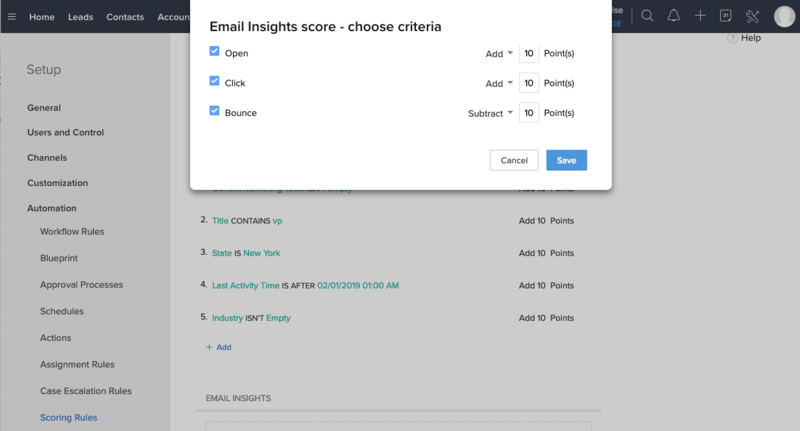 You can add scoring rules based on any contact field variable or based on email activity. For example, selecting “Add+” under the Email Insights section lets you assign point values for email opens and clicks, or subtract points when an email bounces. Likewise, you can add or subtract points based on the lead’s location, title, industry, time since last contact, or annual revenue, giving you fine-tuned control over the criteria you use to define a qualified lead. The last section we’ll set up is Reporting. 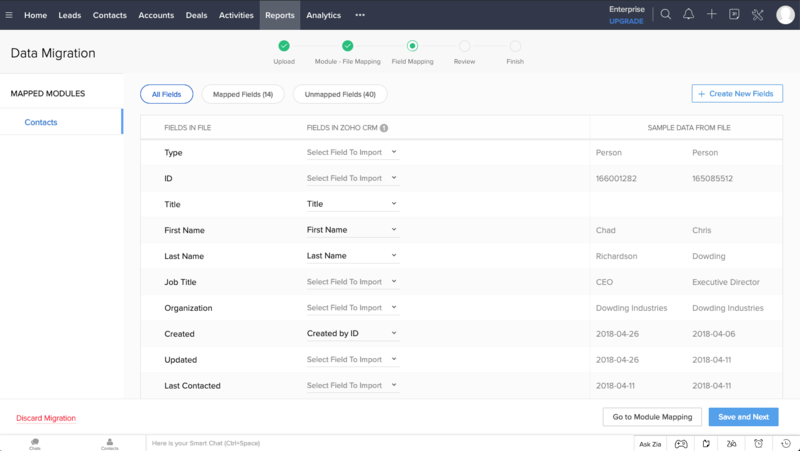 Zoho includes a comprehensive set of reports already and gives you the option to modify existing reports or create reports and dashboards that best fit your sales process. Select “Reports” from the navigation at the top, which gives you access to all of the available reports. You can filter reports with the options on the left, or create a report by clicking the green “Create Report” button in the top right. When creating a new report, Zoho will walk you through the process of selecting the report time, how you want it to be represented, and the filters you’ll apply to generate the most valuable information. Use the drop-down fields to add filters, and select “Run” to automatically update the report information based on your most recent selections. You can save all of the reports you create for future use, and can make them available to your team or keep them private. Now that we’ve configured the important settings, the next step will be to transfer your existing contact data into Zoho. We’ll cover a few ways you can do this, like importing from a spreadsheet or existing CRM. Fortunately, Zoho makes this step relatively easy, but you can also add each contact manually. We’ll also talk about a few more efficient ways to import your information if you already have a large number of contacts. If you’ve used a CRM before and want to transfer your data from the old system, click on the “Getting Started” tab on the right-hand edge of your screen and then click “Migrate Data From Other CRM,” which provides a simple process for you to follow. You’ll select the CRM you want to migrate from or choose “Other CRM” if your option isn’t listed. Zoho will provide you with the specific instructions you can use to move your data. If you currently have all of your leads in a spreadsheet, or if you are using a CRM that isn’t supported, you can import your information from a CSV file. Simply click the “Other CRM” option and drag and drop the CSV file into the area shown. Once you’ve selected the file to upload, Zoho will walk you through the process to migrate your data. You’ll have to import each module separately (Contacts, Leads, Accounts, and Deals), but Zoho will help you map the relevant field information and check to make sure that all of your data matches the right formatting. It will also show you sample data from the file you uploaded so you can verify that your fields are mapped correctly. 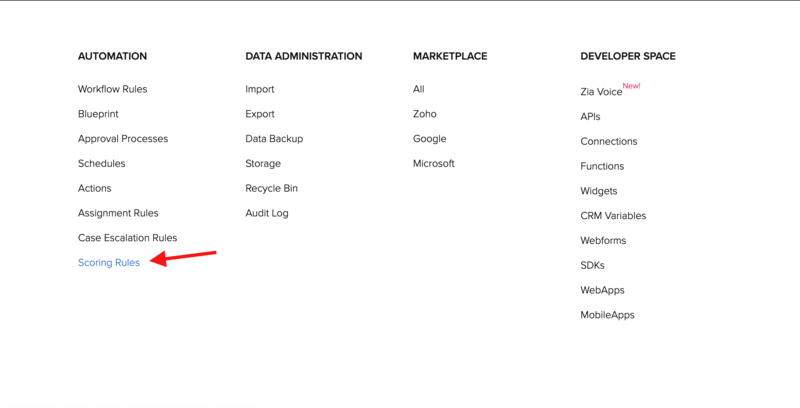 Zoho will ask you to confirm the name of each different type of data field in your spreadsheet. For instance, it may change “Email Address” to read “Work Email” or “Company” to read “Account Name.” Many businesses store unique data related to their contacts, so if Zoho does not have a built-in data field to link with one of your unique data sets, you can create it as a custom field. If your customer information is in your email contacts or marketing software, you can also export that to a CSV file, which can then be imported into Zoho CRM using the following information. This chart will help you create the spreadsheet file you need, and you can then import it using the instructions above. Gmail Click Mail in the upper left corner of your inbox. Then select Contacts, More, and Export. For more detailed instructions on how to do this, click here. Outlook 2010 Select File, Open & Export. Then hover to Import/Export and select Export to a file. For more detailed instructions on how to do this, click here. LinkedIn Simply follow this link and click Export. Mailchimp Head to Lists, choose the list you want to work with, then select Export List. For more detailed instructions on how to do this, click here. Now that you’ve configured your CRM settings and imported your data, we’ll look at the various modules you’ll interact with on a daily basis. Zoho makes it easy to find the information you need with a navigation bar at the top with access to each area of the CRM. You can quickly navigate between your Leads, Contacts, Accounts, and Deals, as well as the reporting and analytics features. 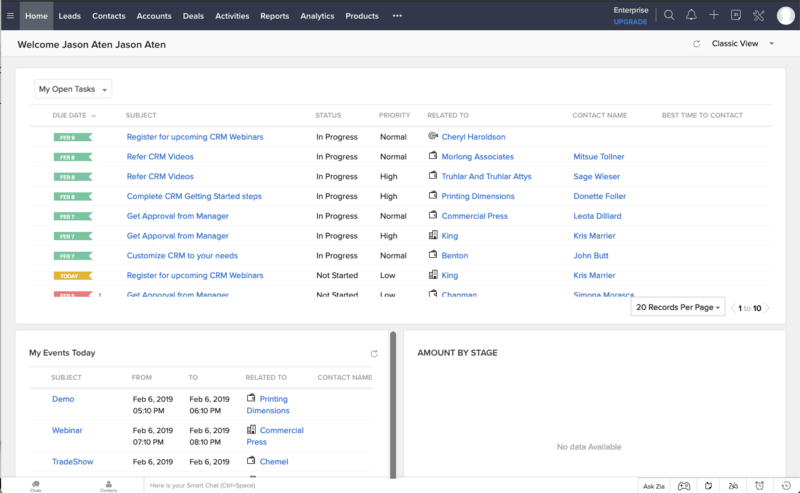 The Home Dashboard is where you first start when logging into Zoho CRM. It gives you a quick look at tasks you have assigned to you, events on your calendar, and other relevant information. You can configure this screen by selecting “Customize Home Page” under the drop-down menu in the upper right. You can also create multiple versions of this module based on different user permissions, letting you tailor this section based on team members’ roles. Leads are contacts who have entered your sales funnel but are not yet customers. Usually, they have completed a lead generation form, sent you an email, or subscribed to an email list. However, you still need to qualify them to determine whether they are worth investing sales resources. The Leads module provides you with the ability to view, filter, and engage with these contacts. This is where you’ll create new leads and update the status of existing leads. Accounts are the companies or departments that conduct business with you as customers; they give you the ability to group contacts within a larger organization. 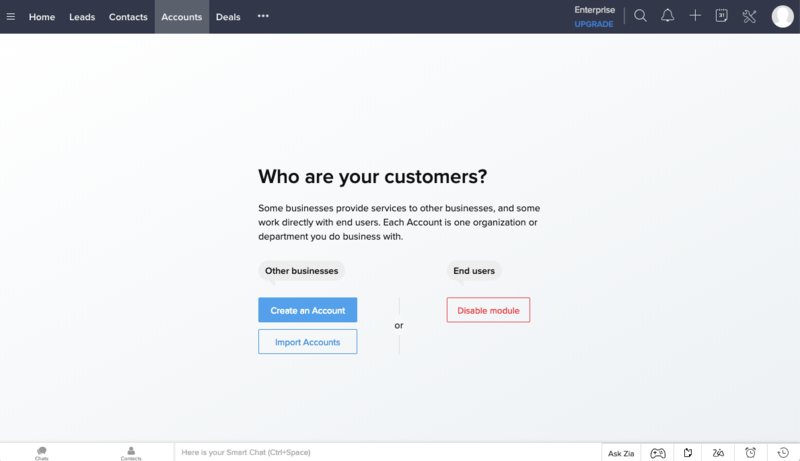 If your company sells directly to individuals rather than to other businesses, Zoho gives you the ability to remove the Accounts module if it isn’t needed. Your contacts are the people who you either sell directly to or work within your customer Accounts. 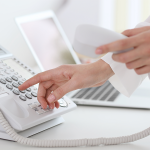 When a lead becomes a customer, they convert to a “contact.” The Contact module has most of the same functionality of leads, but they are no longer scored. In addition, this module color codes each contact based on how long it has been since you last interacted with them, making it easy to prioritize individuals you most need to reach out and communicate with. Deals are the sales opportunities you are moving through your sales process. 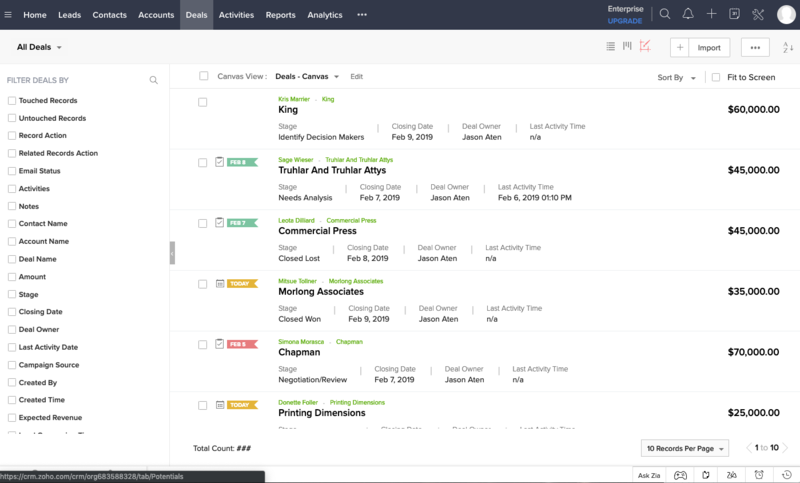 Zoho allows you to view your deals as a list or in a Kanban-style board. Both views give you a quick glance at the value of the deal, the current stage, and how long since the last contact. 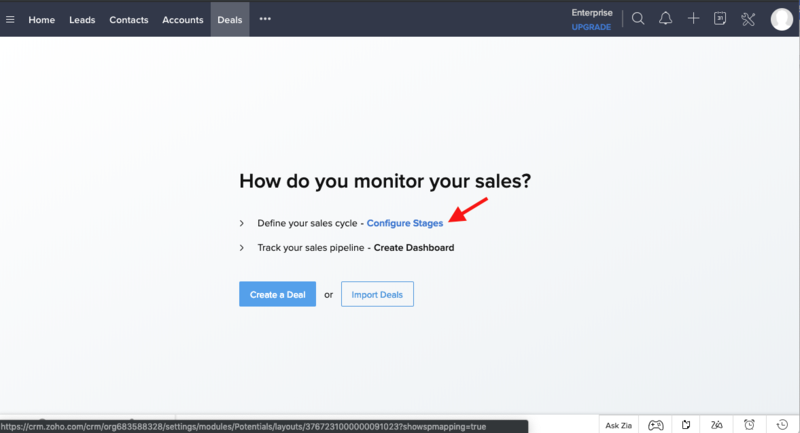 In addition to the Kanban layout giving you a visual representation of where your current deals are in the sales process, it also allows you to easily drag-and-drop deals from one stage to the next. The Activities module serves as a dashboard view of what’s happening as you interact with your customers. It gives you an overview of your calls, appointments, and other touch points as you connect with leads, deals, and contacts. The activities module is especially helpful in keeping your sales team organized and focused on the customer interactions that move your sales process forward. The Analytics module gives you access to several dashboards that provide high-level reporting on your sales performance. 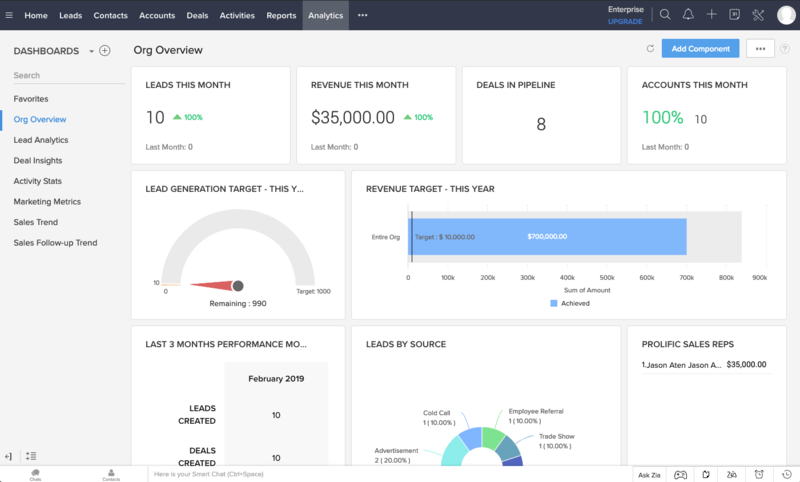 It offers a visual representation of your leads, revenue, sales opportunities, and new accounts, which help you measure the success of your sales plan and the performance of your sales team. This module is especially helpful for managing your team and making adjustments to your sales strategy. 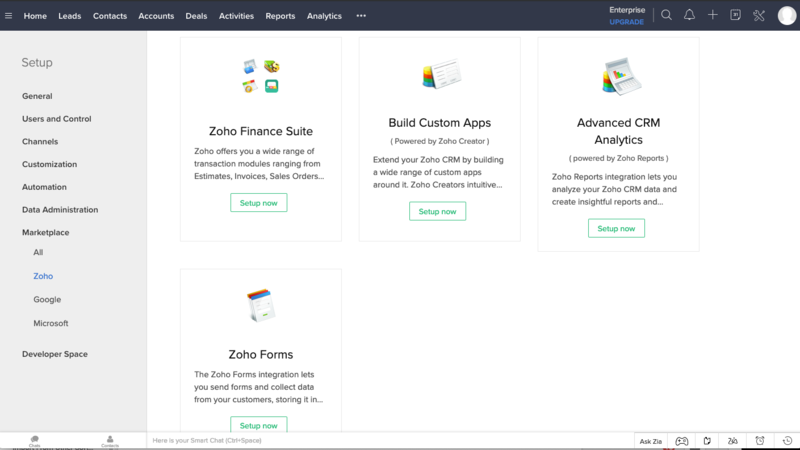 Zoho CRM allows you to extend its functionality with a robust library of integrations, including email, social media, third-party marketing tools, as well as the overall Zoho software suite. Zoho refers to its integration library as Marketplace, which provides search and filtering tools, making it easy to quickly find the apps you need. 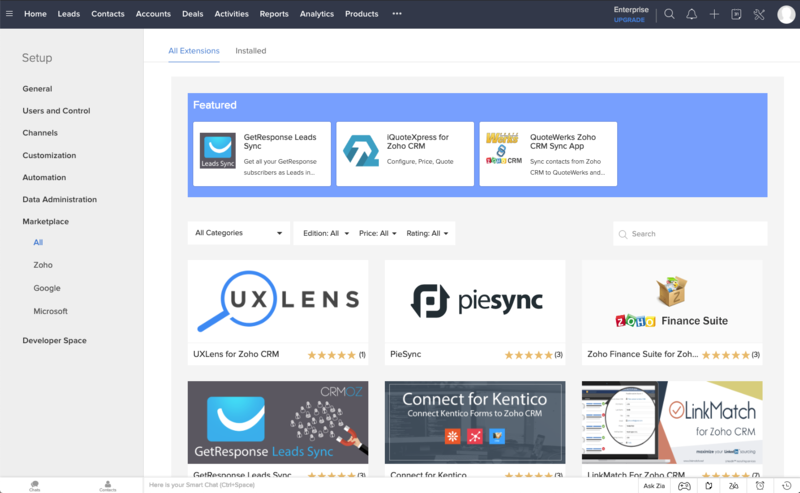 You can even read customer reviews and ratings of the various integrations, along with information about which versions of Zoho they work with. 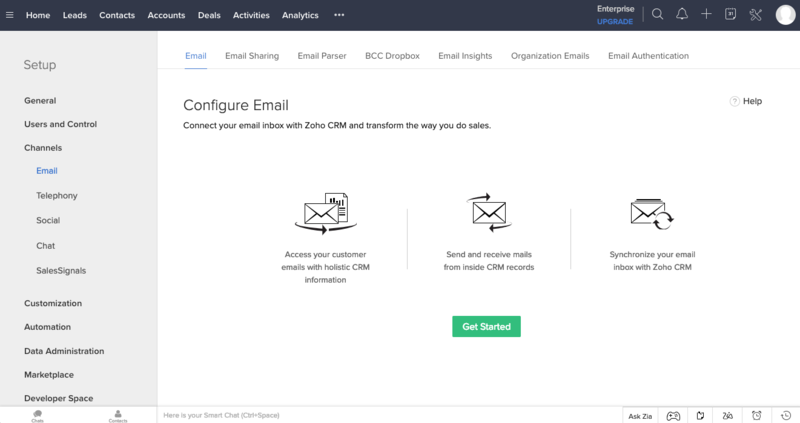 Zoho allows you to connect your business email, providing you with the ability to access your email from within the CRM. It allows you to send and receive emails from within your contact records, synchronize your email records, and link email communications with your leads and deals. To set up your email, select the “Email” link under “Channels” in the Setup panel, click “Get Started,” and follow the simple instructions provided. Look for “Social” under the Channels settings. This allows you to create brands and connect your social media accounts like Twitter and Facebook. 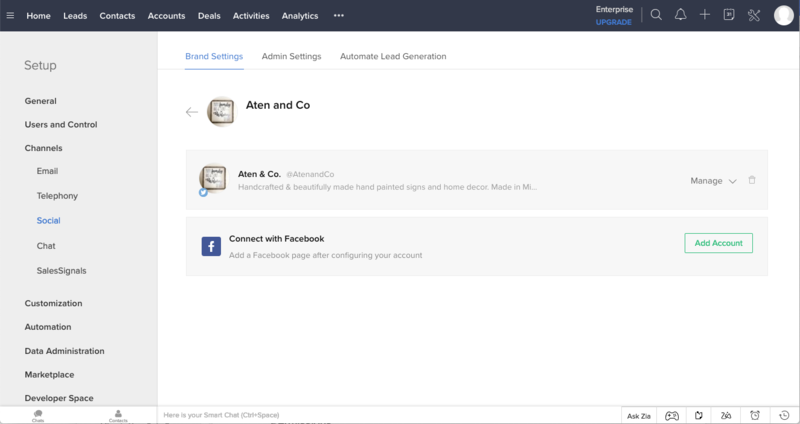 Connecting these accounts allows you to automatically generate leads from social media interactions like “mentions” or “likes.” From the Social Setup Page, simply select “Add Account” and follow the steps to authorize your account and connect your social media profiles. From the Marketplace, you can install extensions for commonly used marketing automation tools like Mailchimp. Simply search for the extension you want to use and select “Install.” This will prompt you to log in to your account and authorize Zoho to access and share data. For example, with Mailchimp, you can sync your leads, contacts, and email campaigns, giving you the ability to share contact information and analytics between software providers. Zoho includes a comprehensive suite of productivity and workplace applications that can be integrated with your CRM. For example, Zoho includes finance software for invoicing, accounting, and order management, which can be integrated to share customer sales information and easily track your finances. Zoho software integrations are available in a dedicated section of the Marketplace and include a simple setup for the additional software you use. 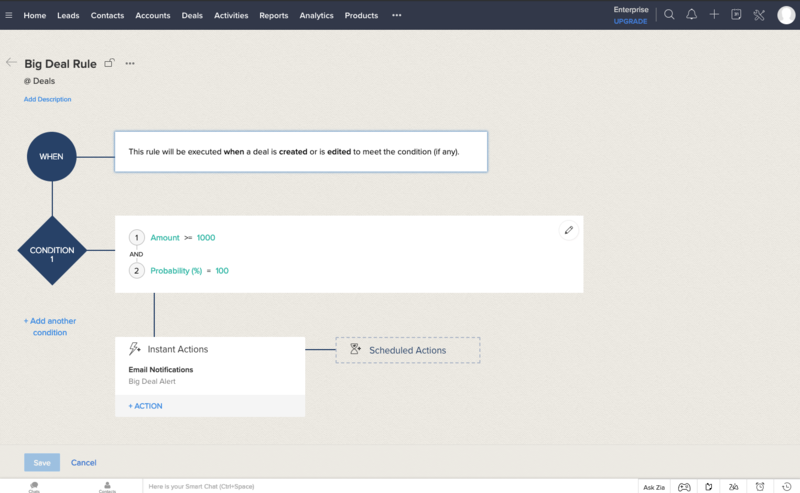 Zoho CRM allows you to create automated workflows that save you time and effort on tasks you repeat on a regular basis. For example, you might create a workflow that sends a notification and follow-up email every time a certain deal stage is reached. You can create several different types of workflows for leads, deals, and tasks. 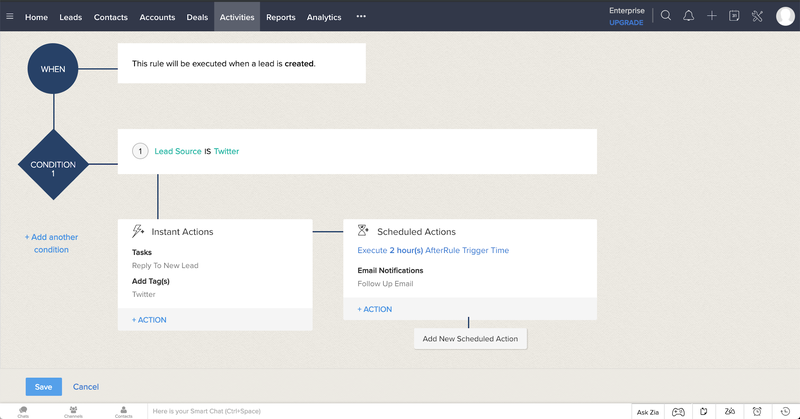 These workflows automate processes related to new leads, deals, and tasks that you are responsible for. Workflows are the steps and tasks you want to be executed based on the creation of a lead or deal. For example, if a lead is generated as a result of a social media interaction, you can create a workflow to notify a salesperson, initiate lead scoring, tag the lead with the social network, and set the lead status. Workflow rules are located under “Automation” in the Setup panel. Here you’ll see a list of rules you’ve created, along with the option to create new ones. Select the blue “Create Rule” button and select the Leads module from the drop-down. Zoho lets you create a name for your rule and provide a description that will help your team keep workflows organized. 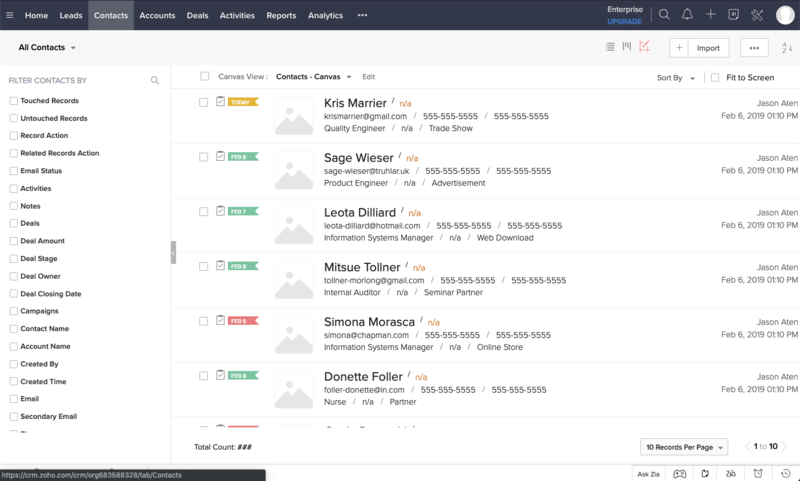 Now that you’ve finished configuring and setting up your Zoho CRM, you’re ready to add the rest of your sales team. From the Setup panel, select “Users” under “Users and Control” to add additional team members. 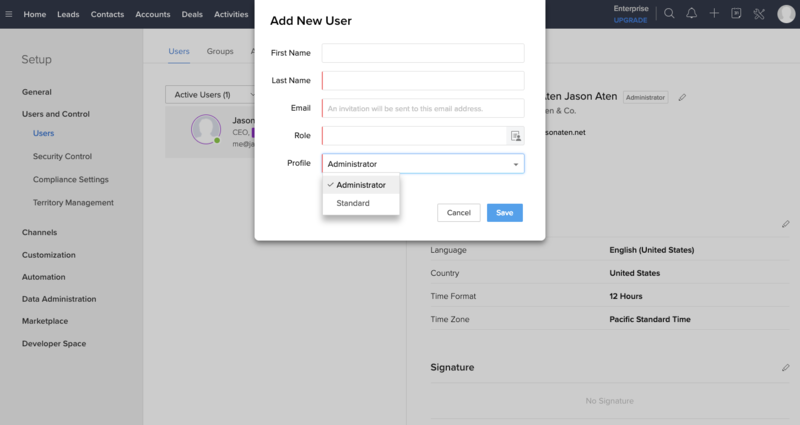 You’ll then see a list of your current users and an option to create new users. Select “New User,” and enter the user’s name, company email, role (manager, sales rep, admin, etc. ), and their profile. Profiles are a set of permissions that control access to the CRM based on the criteria you define. You can set up profiles under the “Security Control” panel within the Users setup panel, and Zoho CRM includes two, Administrator and Standard, to get you started. When you’ve completed entering the user’s data, select “Save.” Each user will be sent an email inviting them to complete the setup of their user account, giving them access to your sales organization. The Security Control settings under the Users panel gives you the ability to turn on or off different modules and settings. Zoho includes the Administrator and Standard profiles, which can be modified slightly, but you can create as many as you need based on the specific roles on your sales team. When you create a new profile, you can choose which modules you want to be activated, and which settings you want the user to be able to modify. For example, you may want to create a manager with the ability to create and modify leads on behalf of their team, assign accounts, and manage users. This gives you the flexibility to customize the access you provide to various team members based on their role and responsibility. 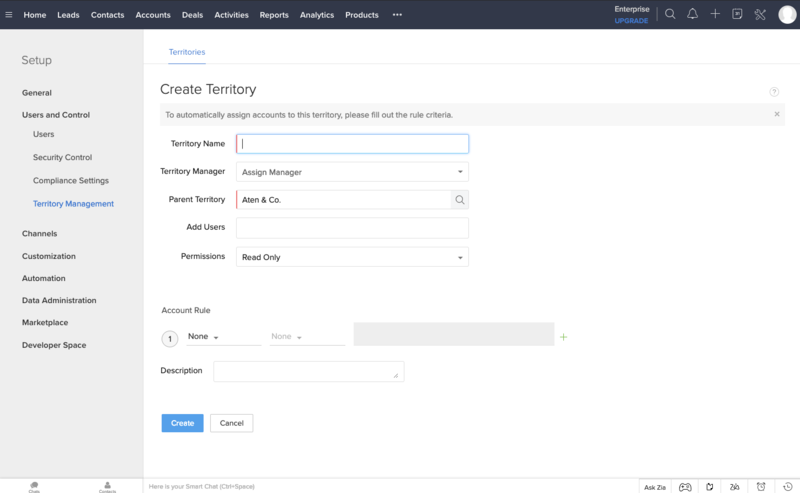 Zoho CRM makes it easy by walking you step-by-step through creating a territory hierarchy and defining the specific criteria for each level. As you create them, you can assign users and permissions, and add account rules to define the location, industry, or company size you want to be associated with each territory. For more information, check out our guide to implementing territory management. 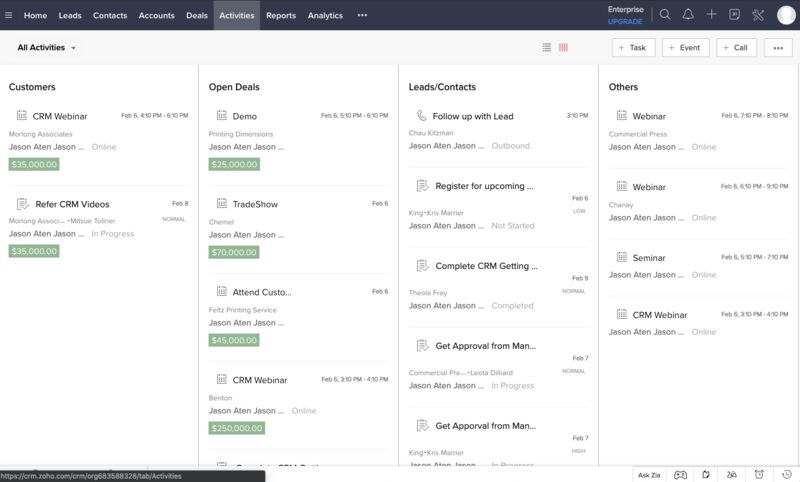 Zoho CRM is a comprehensive CRM that includes lead and deal management, social media integration, automated workflows, and territory management features designed to help streamline your sales process. Following the steps in this article, you have learned how to use Zoho CRM, you have set up your software, and are now ready to convert more leads and turn more deals into revenue for your business. If you haven’t already signed up, Zoho offers a 15-day free trial of any of its plans and offers a free-forever plan for up to three users. Visit their website today to sign up for your free trial account. Good post about the business….